Brisbane Band 385 – Since forming in 2010, they have been devoted to complete audience satisfaction. Offering a musical repertoire to suit all generations, they ensure a packed dance floor whatever the event. Seeing themselves as a vital component of any successful event has ensured both longevity and accomplishment in a highly competitive industry. Their dedication and attention to detail has enabled this vibrant and energetic band to remain one of the country’s premier function acts. Brisbane Band 385 is a 5 piece band fronted by a powerful female vocalist and backed by a group of talented musicians each with a strong vocal presence. Their solidarity as a team, on and off stage, has paved the way for their successes to date. Their diverse set list combines the talents of both male and female vocalists with outstanding musicianship to produce possibly the best sounding and most musically accurate function band around. 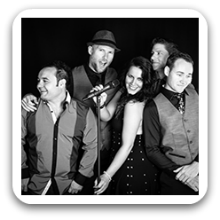 Can perform as a: 5 Piece Band and are available to perform in Brisbane, Gold Coast, Sunshine Coast and Surrounding Areas. We had this band come and play for our Gala Fundraising Dinner and they were terrific! They had a great variety of songs and great energy on stage. They were able to take some of our requests and were very flexible with our runsheet. Overall a great band and we would happily book them again. Just wanted to say a big thank you for being our outstanding entertainment at the Festival Main Stage – everyone loved them, they were a great fit for the crowd with all the right songs, feel and presence! We would love you back again for the next race day! What can I say other than Fantastic! 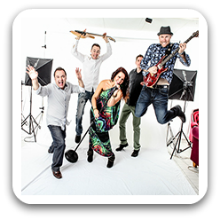 Great musicians, performers and extremely professional with a huge variety of songs and styles. Would absolutely book again. Thanks to the band for making our night. What a great Band, they had everyone at the Ball on their feet dancing the night away. A vast selection of songs, very professional, organised and extremely helpful. Would definitely book again. Thank you for a wonderful night. A huge thank you to all the members of the band for making our son’s 21st birthday party a very entertaining and a memorable one. Very professional, accommodating, extremely talented with great music. Fantastic night had with lots of dancing! The band were great and so accommodating and full of energy. Would definitely recommend. Everything you’ve read on this page about this band is true – they are a superior band made up of exceptional musicians who are not just great entertainers, but also lovely people. We had them play at my 40th and we simply couldn’t be happier. They were prompt and professional but also relaxed and versatile. They were kind enough to play one of my favorite tracks and allow me to sing along – something which they did with tremendous skill and soul. Throughout the night they kept the crowd energized and had us singing and dancing hour after hour. Pene, Thank-you very much for the review. We’re pleased you’re pleased 🙂 We had a blast playing for you and your guests and of course would be more than happy to do it again. A massive thank you to such a wonderful band. You made my husbands 40th an amazing night. Your songs were awesome and you sounded fantastic. Lots of comments from friends throughout the night about how great you were and wondering how I found you! If we ever have a party again I know who to call. Thank you so much!